This week we are meeting some cold weather loving animal friends! We’re off today to meet one adorable bird who lives up in the cold near the arctic circle. 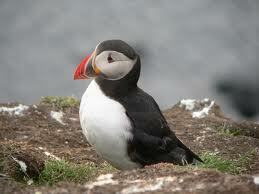 Atlantic Puffins can fly unlike penguins. Atlantic Puffins sure are snappy looking birds with their bright orange beaks and feet! And they can fly and swim! We wish we could fly and swim!